The global luxury goods industry, which includes drinks, fashion, cosmetics, fragrances, watches, jewelry, luggage and handbags has been on an upward climb for many years. The value of the global personal luxury goods market was 212 billion euros in 2013 and is estimated to be worth about 249 billion euros in 2016. Although the technical term luxury good is independent of the goods' quality, they are generally considered to be goods at the highest end of the market in terms of quality and price. The United States has been the largest regional market for luxury goods and is estimated to continue to be the leading personal luxury goods market in 2015, with a value of 78.6 billion euros. 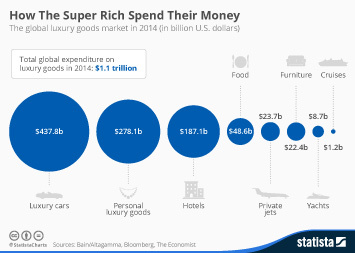 Luxury or prestige brands are brands for which a majority of its products are luxury goods. Louis Vuitton is the most valuable luxury brand in the world, with a brand value of about 28.51 billion U.S. dollars. The LVMH Group's total revenue for the 2016 fiscal year was about 37.6 billion euros. The personal luxury goods industry is expected to continue to grow, especially in the Middle East; the market is expected to increase by 19 percent in 2015 to total about 8.1 billion euros. More interesting topics from the industry "Luxury Goods"